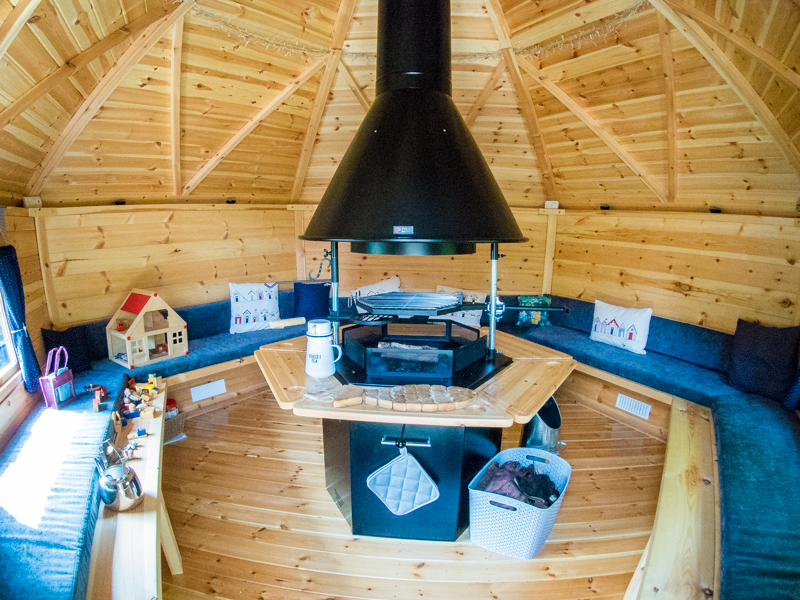 We own a 10 square metre BBQ Cabin (aka Hygge / Grillkota Hut) with six walls that slope outwards, supplied and fitted by Barbecue Lodges, Somerset. Sat in the middle is a Polar Grill BBQ and this enables us to enjoy a BBQ whatever the weather is outside, actually the worse the weather the better the experience is. As you can see it is also a great play area for the grandchildren. Cooking on an inside BBQ is exactly the same as if you were outdoors, but it is best to avoid over fatty foods like cheap burgers and sausages. These will create way too much rancid smoke and not good when in an enclosed space. You want your guests to eat fabulous food and often simple recipes using great produce will impress more. One good piece of advice is don’t try to cook everything at once, have lots of mini courses that you can cook leisurely, this will lower the stress levels and guests will enjoy watching you cook each course. We love to cook seafood, chicken, vegetables, vegetarian and vegan food on the BBQ and are a big fan of Middle Eastern spices, so expect to see a lot of these recipes. All these recipes are really only a guide, please feel free to add or subtract ingredients to suit your own tastes. We will be adding more recipes, so please revisit regularly to see our latest delicious additions.